Ride begins at 8 a.m. 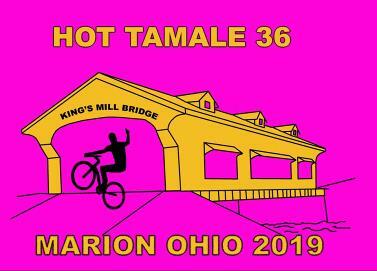 The Hot Tamale is a beautiful, flat ride in north central Ohio., with 9, 19, 33, and 66 mile options. Riders on the 19, 33, and 66 mile routes will visit the beautiful King’s Mill covered bridge, while the 66 mile cyclists will also have a chance to enjoy the Tallgrass Trail. The route meanders along quiet farm roads and through charming small towns. Helmets are mandatory. Again this year we will offer child-sized t-shirts. See pictures of past rides or read quotes here. Register on-line, or print out a registration form and mail it in. Can I register on the day of the tour? Yes, although ride shirts are only available to pre-registered cyclists. The day of ride cost is $20 for ages 11 and up, and kids 10 and under are free. To save time, you can print a day of ride registration form to fill out at home and bring with you, or just fill out a form that day. Is a GPS download of the route available? Yes. We’ll have a route available for download a few days before the ride. The ride begins in the Waldo Community Park in Waldo, Ohio. Waldo is on US Route 23, between Delaware and Marion, Ohio. If entering Waldo from Rt. 23, turn left at the BP station and right at G & R restaurant. The park is about 1/2 mile ahead on the left. Just follow the signs! Click here for a map. Homemade cookies, fresh strawberries, bananas, sandwich fixings, and much more! The 2019 shirts will be safety pink and feature a design celebrating the Kings Mill covered bridge. Check our frequently asked questions page. If you don't find the answer there, contact us by clicking here. Kids love the Hot Tamale! We'll welcome you with smiling faces and special gifts for the kids. Our flat 19 mile ride is a children's favorite, and our 9 mile family fun route is a delight! You'll love our homemade cookies! Kids aged 10 and under ride free! Children must be accompanied by an adult. $1 will be donated to the Marion Tallgrass Trail on behalf of each cyclist!